Anyone with a desire to preserve our planet has no choice but to see Chasing Ice, the gorgeous, inventive documentary released last month. As of this writing it has been shown to selected audiences but has yet to reach the popularity of a film like “An Inconvenient Truth.” Give it time, however, and hopefully further promotion, because it is truly revelatory. Produced by Paula DuPré Pesmen and Jerry Aronson and directed by Jeff Orlowski, the film is a unique pictorial about global warming, which left me impressed, thoughtful and sad. This may sound rather technical, but the film is accessible to a wide range of viewers, including children. Consider taking your kids along. Take time to explain the ideas to them. It takes no more than 15 minutes to get the full story, namely, that the earth is slowly saying goodbye to the ecological systems that have sustained it for millennia. Watch it on the big screen if you can, where you will experience the full scale and feeling of the problem we face, and perhaps be prompted to some form of action. There are plenty of environmental groups that need volunteers. The scientists interviewed in “Chasing Ice” have studied global warming and its manifestations for years. As they provided the narration, I was mesmerized by images of Greenland's glacial ice cascading into the sea, gradually exposing rocky stretches of sand-strewn landscapes not seen in thousands of years. The scientists also explain the process of filming these images; cameras were embedded in stone so as to capture hour-by-hour photographs of single scenes. The cameras were mounted in 27 sites, including Canada, Montana, Alaska, Iceland and Norway. The first year went badly. About half the cameras were destroyed by the winter conditions, forcing the dejected team to redesign and rebuild a new set of them for the next year. The film was clearly an exhausting one to produce. Needless to say, it cost more than a pittance. Funds came from a host of philanthropies, corporations and individual contributors, all listed in the credits. Take the time to see “Chasing Ice,” even if it is not the type of film you would typically see. These are not typical times. We must begin to act. In the wake of a devastating hurricane on the East Coast of the United States, the United States may finally be taking steps to address climate change. Ordinary citizens must take on a greater role too. We cannot dwell on our sadness, but work to provide hope for our children, who will suffer the most if we continue to ignore the disaster on the horizon. An earlier version of this review misstated the names of the film’s producer, director and subject. The producer is Paula DuPré Pesmen, not Pensen. A second producer is Jerry Aronson. The director is Jeff Orlowski, not Paul. 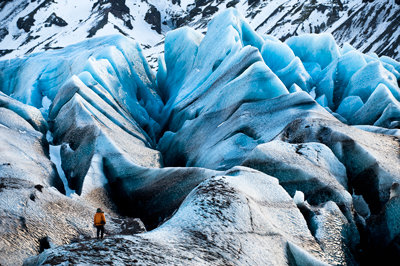 The subject is James Balog, not Barlog. The review also misstated the acronym for the Extreme Ice Survey. It is EIS, not EOS.